Dramatically weakened by recession, U.S. automakers in the next few years are likely to be challenged on their home turf by car manufacturers from the developing world. But, while the Chinese were expected to be the first to land in North America, it now looks like India will beat China to the U.S. market  and not with cars, but with light trucks. By the end of the year, Mumbai-based conglomerate Mahindra & Mahindra  best known outside India for manufacturing tractors  plans to launch two-door and four-door compact pickups that would compete with established brands such as the Toyota Tacoma, the best-selling compact truck in the U.S., and the Ford Ranger. Powered by clean-burning diesel engines and tailored for U.S. buyers, prices for the as-yet unnamed pickups will range from $20,000 to $30,000, says Pawan Goenka, president of Mahindra & Mahindra’s automotive business. 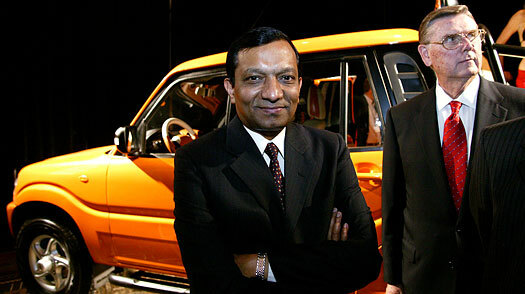 The company also plans to launch two SUVs, called the Scorpio and the Bolero, in the U.S. next year. Mahindra & Mahindra, which has annual sales of $6.3 billion, is the third largest tractor company in the world and is India’s largest SUV maker. The company is no stranger to North America  it’s been selling tractors in the U.S. since 1995 and has assembly plants in Texas, Georgia and California. By launching vehicles aimed at American consumers, the Indian company is wading into a market that has been decimated by higher fuel costs and plunging sales amid a recession that has driven GM and Chrysler to restructure under bankruptcy court protection. U.S. sales of gas-guzzling SUVs have fallen from a peak of 2.84 million in 2003 to just 1.26 million last year, according to J.D. Power and Associates. SUVs accounted for 17.1% of U.S. auto sales in 2003; in the first five months of 2009, SUVs made up just 7.8% of the market. Goenka, however, says Detroit’s woes create opportunities for new brands to gain a foothold in the U.S., which remains the top market in the world for light trucks. “The automakers’ struggles have definitely given us an opening,” says Goenka, who spent 14 years in GM’s research & development division. For one thing, Chrysler, GM and Ford are steering away from trucks and SUVs and toward smaller cars, leaving more room for newcomers. And as the Big Three shed hundreds of dealerships, Mahindra & Mahindra, along with its U.S. partner Global Vehicles of Alpharetta, Georgia, are finding it easier to establish a sales network. Global Vehicles, an auto importer and distributor, has signed up 336 dealers, some of them former outlets for GM, Chrysler and Ford, in 50 states, says John Perez, the company’s CEO. Although Chinese carmakers including Geely Automobile Holdings and Chery Automobile have announced plans to break into the U.S., so far none have been able to secure distribution networks. Despite the weakened state of U.S. automakers, Mahindra & Mahindra will face a tough battle convincing consumers to switch truck brands, analysts say. “The pickup market is one of the most challenging to enter, since the loyalty to Detroit products in this segment is high,” says Colin Langan, an auto industry analyst for UBS Financial Services in the U.S. “A lot depends on pricing, brand recognition, reliability and consumer acceptance,” says Darius Lam, associate editor of Autocar Professional, a Mumbai magazine. Perez, the Global Vehicles CEO, notes the Mahindra pickup, while capable of getting 30 mpg, will have a payload capacity of 2,700 pounds. In comparison, the Toyota Tacoma has a payload capacity of 1,570 pounds and delivers 26 mpg, he says. “Once Americans see that their neighbor has a pickup which gives 30 mpg, they’ll say, ‘maybe I should look at that,’ ” Perez says. Mahindra will also have to contend with skepticism surrounding the made-in-India tag. Indian companies are recognized by Americans for outsourcing and call centers, not for manufacturing prowess. The most famous Indian manufacturer today may be Tata Motors, which garnered international recognition earlier this year when it launched its $2,000 minicar, the Nano. Tata plans to start selling the Nano in the U.S. in 2011. To create brand awareness for its pickups and SUVs, Mahindra is expected to spend around $20 million on Internet and print advertising leading up to the trucks’ debut. The vehicles will be imported from India; the company has no immediate plans to build pickups in the U.S.
Mahindra and its U.S. partner have been working closely to design trucks that suit American tastes. Whenever newly minted U.S. dealers have visited Mahindra’s production and research facilities in India, they have come armed with cups from McDonald’s and Starbucks to test the size of the cupholders. Even the seats will be larger than those on Mahindra vehicles in India. “We are big guys with big butts,” says Perez.